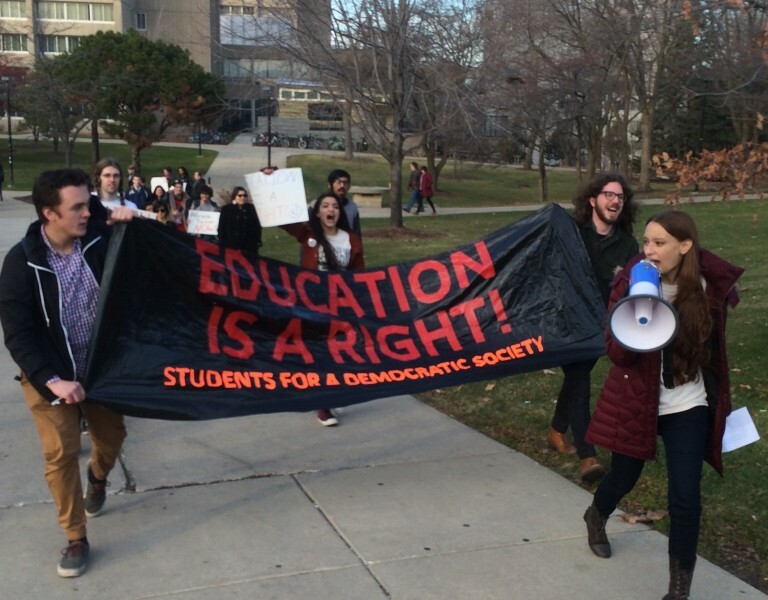 Milwaukee SDS protests cuts to UW | Fight Back! 1. No cuts to instructional units! Instead, UWM should ‘chop from the top’ by cutting non-instructional positions and salaries in excess of $80k per year. Since 2011, UWM has added nearly 50 such positions and increased their salaries by an average of nearly 10% per year. 2. Chancellor Mone must publicly pledge to oppose all tuition increases while he is chancellor. 3. Wages for campus workers and stipends for graduate teaching assistants must be increased. 4. Resource centers and services that serve oppressed or marginalized students, such as African-American Student Academic Services, the Black Cultural Center, the Roberto Hernandez Center, the Women's Resource Center, and the LGBT Resource Center, must continue to be funded. 5. Tenure and shared governance must be preserved. Frankie Mastrangelo of the Milwaukee Graduate Assistants Association AFT Local 2169 spoke next, “This is a corporate takeover of our public universities.” Mastrangelo is a teaching assistant at UWM and TAs like her could be particularly affected by layoffs and pay cuts. “Chancellors and vice chancellors make $300k or more, while adjunct instructors make $20-30k." The protesters, which included members of SDS, Youth Empowered in the Struggle, the Student Union Movement and Jewish Voices for Peace then marched to Chapman Hall where the Chancellors Campus Organization and Effectiveness Team (CCOET) were to be holding a public meeting concerning how to most appropriately allocate the cuts to the university. However when the students arrived at the hall, its doors were locked and university security was present around the perimeter. Students, faculty and staff had been locked out of a public meeting the administration had promised to them. “The power of student voices are clear now that Chancellor Mone cancelled the 'public' budget meeting and locked us out from his office,” said Marina Leigh, a student at the university and a member of Students for a Democratic Society. When she and several other SDS members confronted the Dean of Students Timothy Gordon, he flatly denied any sort of public CCOET meeting being scheduled for that day at Chapman or anywhere else on the university. However on the UWM website it states that the CCOET was to meet “every Wednesday from 3pm – 5pm” and students had received emails that there would be a meeting that day. Hours after the rally, it was posted on the website that the CCOET meeting had been “canceled”, contradicting what Gordon had told SDS members.